I have resisted joining four corners Alliance to no avail. Lately i joined four corners thanks to the pay forward system (PIF) available in the four Corners Alliance back office. This system is being used by Four corners partners to make money Online. It makes it easy fir new members to sign up and start earning with very little stress on who to recruit since the system permits you to keep money for your downline. But , What is Four Corners Alliance? 4 Corners is a company located in Las Vegas USA, that equips people with financial education from basics to pro. In order to make business better, the company has introduce a network marketing plan with excellent compensation plans to partners who can build a network with the 4 Corners. -A landing page and a lead funnel where you can generate lead and manage. - a free auto responder service just to name but few. - Start up fee is 18 $ . i. You should belong to a Team( 4 Corners Alliance). ii. You should have at least 18 $ or $ 36 if you want to work with my team. iii. Have a Solid Trust Pay Account. If you don't have then create an STP Account for free. If all is set then let us get started. Other payment options are Safety Pay and Bitcoins. Those who have an existing account , type backoffice.fourcornersalliancegroup.com and enter you login details. and Proceed to Check Out. 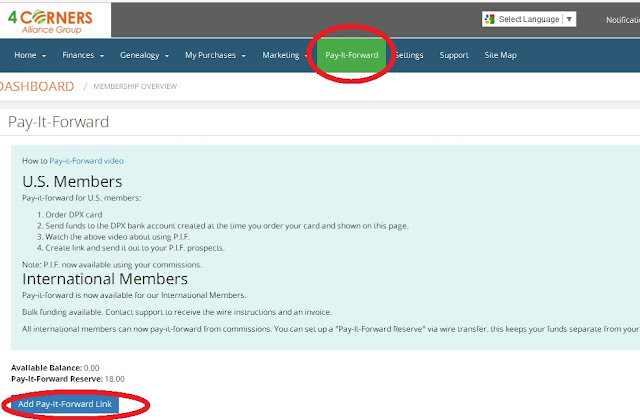 After Checkout, Return to your Account and Click on '' Pay-It-Forward'' Displayed on the Top Bar of your Dashbaord. On the new page that Opens, Click on Add Pay-It-Forward Link. In the place of MEMO, you can write '' Team Build''. Select Level one if you have paid 18. Click on Submit and that is it. You should see Team Build displayed at the bottom of the page. To Get you PIF link, Click on View All. A window will pop on on your screen. Copy the Link and Send to your downline to sign up. He will be able to Sign up without paying. That is it, The PIF link is a prepaid link. That was it Create the Millionaire mind set by joining four Corners Alliance. Fore more information email: ransbiz@live.com . Before contacting me, please make sure you are willing to invest $ 36 and recruit 2 people in your network. Be willing to work like a team. The stronger the team, the bigger the profits. Happy earning. Four corners business opportunity offers network marketing to it partners which permits them to make money online. The products offered by 4 corners can be sold by the partner to make more money. There are several presentaions of this business opportunity. Wtach the Video below to know more about 4 corners. Have you ever used the pay forward system of Four Corners Alliance Group? We will equally welcome any experience with 4 Corner Alliance.